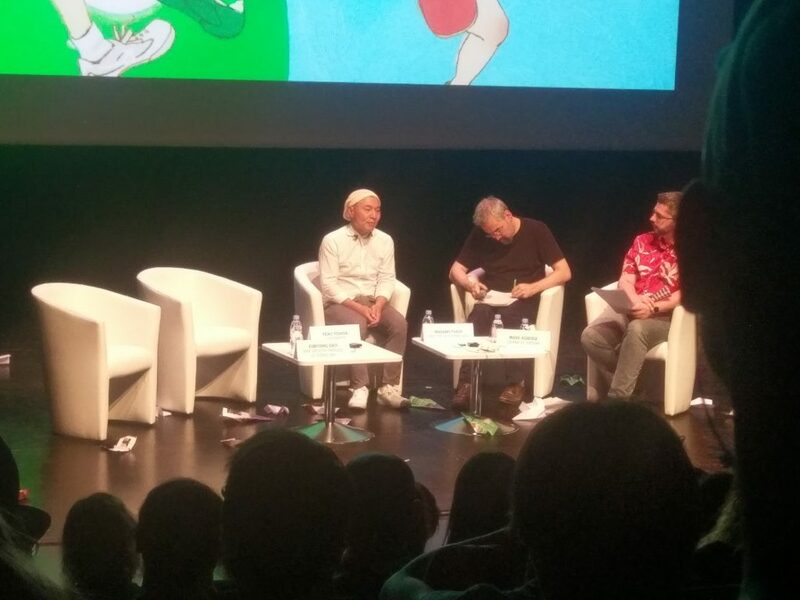 Masaaki Yuasa arrived to the 2018 edition of Annecy International Film Festival accompanied by his most trustworthy ally in recent times, Eunyoung Choi, who has undeniably taken a step back at a creative level in favor of management duties at their studio, Science Saru. She still does have a hand in their projects of course, and talking about Yuasa nowadays inevitably means taking her presence into consideration. Perhaps less expected was the third guest: renowned screenwriter Reiko Yoshida, who has slowly but surely become a major figure in the thriving Japanese theatrical animation space. Readers of this site likely know that she’s a personal friend and collaborator of Naoko Yamada, so the growth of the Kyoto Animation director has benefited her career as well, but other contacts she’s made in late-night and daytime television like Tsutomu Mizushima are also trusting her as they venture into more ambitious film projects. Even Kosaka Kitaro’s Okko’s Inn, also first screened in this festival, was penned by her. Yoshida’s name might not stand out as much as the other guests, but she can proudly stand by their side. 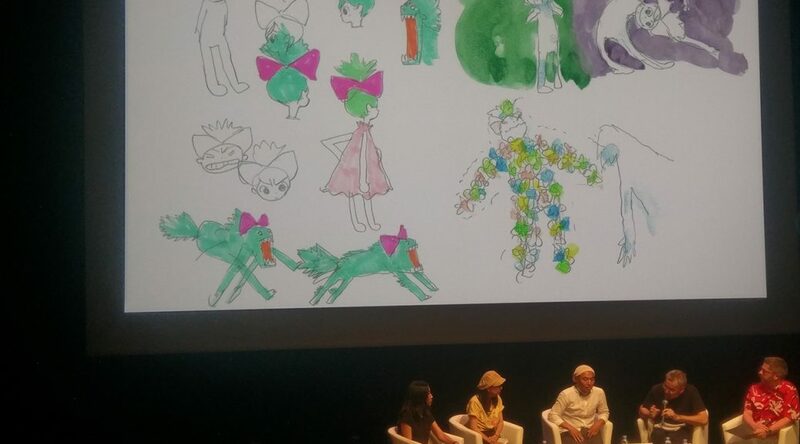 Yuasa offered a look back at his career to date, starting from the point where he developed an interest in directing that he didn’t originally have. The most interesting recurring theme was how clearly fan and critic feedback affected his work, which you wouldn’t necessarily expect from a creator with a bold identity and who’s rightfully perceived as unique. His continuous quest to make his works more intelligible without losing their soul, in order to appeal to viewers who constantly came to him saying they didn’t quite get it, or even precise changes like the switch to a rounder and more pleasant aesthetic for Kaiba because part of the audience had been put off by the sharp rawness of Mind Game and Kemonozume — there’s been kind of a conversation between Yuasa and the people who watch his works, whether they’re aware of it or not. The arrival of Yoshida and Choi to the stage allowed them to explain the synergy between the team, with the writer’s storytelling expertise making up for Yuasa’s weaknesses and Choi facing the exciting but also troublesome task of keeping up with the director’s vivid imagination. The most exciting moment of the event however had to be the reveal that Science Saru is already producing their next feature film with Lu’s main team, having started working on it after wrapping up Devilman Crybaby, slated to open in 2019. Although they’re not quite sure on the exact date yet, it should be a given that it’ll premiere before the Tokyo 2020 Olympic Games even if it’s pushed back, since the setting of this new tale happens to be a region of coastal Japan that will be hosting some competitions. They didn’t explicitly state it, but since surfing is a theme in the movie, it’s a given that they’re looking for some synergistic promotion with the timing of the project. Considering the teaser was mostly composed of storyboard excerpts, a few quick colorful image boards, and only a tiny bit of pre-animated footage to get across the feel of the project, it’s clear that it’s still in its early stages. So what’s it about? Yuasa is back with what he enjoys the most: a love story. Unlike most of his work, however, this time we’re looking at a pure, cute and straightforward romance… to a point. Water, which was a big factor in Lu and exploited the studio’s usage of Flash in a fascinating way, makes quite the big return in this story between two normal people who are madly in love, which takes a curious turn when the man is transformed into water. While they didn’t share many more details regarding the narrative, their intent to use this quirky premise in amusing ways is obvious, as seen in the image board where the boyfriend tries to wear a furry outfit to be able to hold his lover again.